Soils in Eastern San Joaquin County range from sandy loam to clay, with wide areas of the region influenced by centuries of flood plain run-off. Soil studies in the region reveal that the flood plain deposits vary in thickness and density, changing from one soil type to another within a matter of feet. 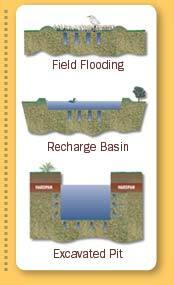 The Farmington Groundwater Recharge Program (Program) is designed to take advantage of these unique characteristics to produce the most cost-effective, cost-efficient and site-friendly method for recharge. The Program seeks to enroll parcels ranging from 20 to 100 acres and construct field-flooding recharge facilities. A slope of no more than three degrees is typically optimal, allowing varied water depths from zero to 18 inches. A slight slope is beneficial as it provides a variety of water depths for various waterfowl species. Vegetation in the recharge basin may either be stubble from the prior year’s crop, natural vegetation or a combination. Fields without vegetation will change as water is applied and recharged. Monitoring wells would be installed to track changes in groundwater elevation and groundwater quality in response to percolation of surface water into the groundwater aquifer. Under terms of the property agreement with the landowner, construction of field-flooding recharge facilities would be managed by Stockton East Water District or the U.S. Army Corps of Engineers. Short dirt levees may be installed in the recharge basin for erosion control. Dirt levees would be pushed up around the perimeter of the recharge basin. Some levees may be covered with plastic to control wind erosion. Surface water would be delivered to the parcels during the winter months, usually beginning with the first flood flows to the watersheds. These waters will be drawn from Calaveras, Mokelumne, Littlejohns and Stanislaus watersheds. Depending on the site’s location to the water source, the final delivery may be via open ditch or pipeline. Supervision of the flow of the water is provided by the Program consultants. Maintenance during field flooding would be similar to typical irrigation practices for crops. This includes monitoring for levee breaks, erosion control and other factors specific to the facility. Dry season maintenance will be site specific and could include levee and erosion control maintenance and tilling. Monitoring wells will be positioned at each site and managed by the Program sponsor. These wells will monitor changes in groundwater elevation and groundwater quality in response to recharge. These wells will also be useful in determining the direction of groundwater movement. Recharge facilities that show a consistent lateral migration of water – and therefore present a likelihood to damage nearby crops – will be removed from the Program.